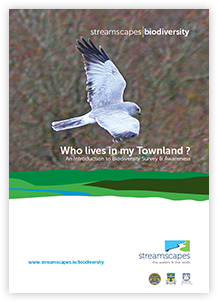 Streamscapes » Who Lives in my Townland? Who Lives in my Townland? This booklet, which features stunning wildlife photography by the County Clare photographer John Murphy (see www.waxwingfilms.ie), introduces the reader to the subject of Biodiversity and then goes on to encourage an active participation in surveying local wildlife and learning how to record these sightings of various species on to the National Biodiversity Database (www.biodiversityireland.ie). This exercise may be done with your school class, your community group, or with members of your family. Welcome to the journey!